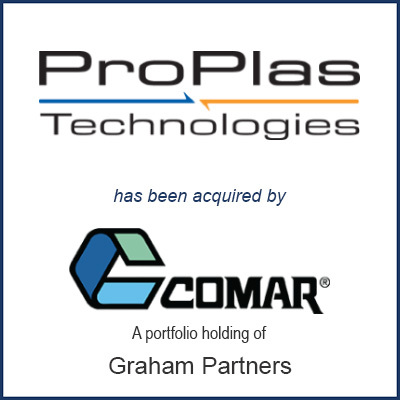 Garden Grove, CA – June 2017 – Comar LLC has acquired injection molder and mold maker ProPlas Technologies. ProPlas specializes in complex injection molding, assembly, and mold making and serves a variety of end markets including consumer goods and medical devices. Headquartered in Voorhees, NJ, Comar has seven strategic manufacturing and distribution locations and employs a host of rigid plastic packaging technologies and related value-added services. Comar is a portfolio holding of Graham Partners of Newtown Square, PA. The acquisition is expected to enhance Comar’s ability to provide solutions to the diagnostics and medical device markets, enhance the product development cycle, and provide additional injection molding capacity in a strategic location. Molding Business Services of Florence, MA served as the exclusive adviser to ProPlas Technologies in connection with the sale. Excerpts from the following news articles published by Plastics News and Comar’s press release were used above. Click below to read the full articles.